This false-color mosaic, made from infrared data collected by NASA's Cassini spacecraft, reveals the differences in the composition of surface materials around hydrocarbon lakes at Titan, Saturn's largest moon. Image released Oct. 23, 2013. 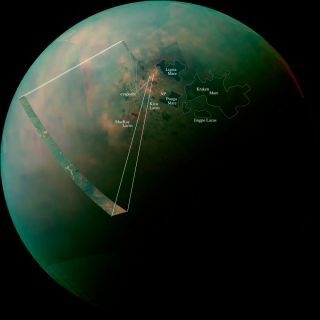 A clearer view of Titan's wet northern region could provide clues about the moon's hydrologic cycle and the evolution of its seas. New images released by NASA this week even revealed the Titan equivalent of salt flats surrounding its northern lakes, some of which are as big as the Caspian Sea and Lake Superior combined. The vast hydrocarbon seas and lakes (dark shapes) near the north pole of Saturn's moon Titan sprawl out beneath the watchful eye of NASA's Cassini spacecraft. Image released Oct. 23, 2013. The vast majority of Titan's liquid bodies are found in its north pole, but this region had been shrouded in a thick cap of haze ever since Cassini arrived in the Saturn system in 2004. Recently, that northern ice cloud has been dissipating and a similar one is forming over the moon's drier south pole, signaling a change in seasons for Titan. "Titan's northern lakes region is one of the most Earth-like and intriguing in the solar system," Cassini project scientist Linda Spilker, based at NASA's Jet Propulsion Laboratory, Pasadena, Calif., said in a statement. "We know lakes here change with the seasons, and Cassini's long mission at Saturn gives us the opportunity to watch the seasons change at Titan, too," Spilker added. "Now that the sun is shining in the north and we have these wonderful views, we can begin to compare the different data sets and tease out what Titan's lakes are doing near the north pole." Almost all of the hydrocarbon seas and lakes on the surface of Saturn's moon Titan cluster around the north pole, as can be seen in this mosaic from NASA's Cassini mission. Image released Oct. 23, 2013. The mosaics images released by NASA are based on infrared data from Cassini's flybys of Titan on July 10, July 26, and Sept. 12, 2013. The false color image highlights the differences in the composition of material around the lakes, with the orange blotches thought to be organic chemicals left behind long after a liquid body evaporated — similar to the way salt pans form on Earth after pools of water evaporate, leaving behind a flat stretch of salt and other minerals. "The view from Cassini's visual and infrared mapping spectrometer gives us a holistic view of an area that we'd only seen in bits and pieces before and at a lower resolution," Jason Barnes, a participating Cassini scientist at the University of Idaho, Moscow, said in a statement. "It turns out that Titan's north pole is even more interesting than we thought, with a complex interplay of liquids in lakes and seas and deposits left from the evaporation of past lakes and seas."